After making the mistake of installing Windows 10 in my pc and trying to figure out what to do next, I hoped all of my files hadn't been swept away with a single click. Then I realized I was a reasonable facsimile of Robert De Niro's rather finely-aged character in his new movie The Intern. Ben is 70 and a retired widower with time on his hands. He misses being in the thick of the work he enjoyed as a younger man. As Ben is a neat, responsible, organized person, the opportunity to be a senior volunteer intern at About The Fit seems to be a good fit for him. About The Fit is an online retail clothing concern the script has located in Brooklyn that's aggressively run by a savvy young woman with the epicine handle of Jules. 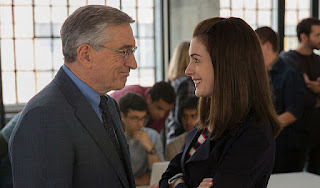 The most excellent Anne Hathaway has the part of Jules and plays it with as much aplomb as De Niro does Ben. Nancy Myers, responsible for Something's Gotta Give, It's Complicated and The Parent Trap directed The Intern. It's another of those delightful movies that's set in a world perpetually sunny and warm with everyone pleasant and accommodating --- especially Ben. Think: pretty, pretty perky. Issues aren't too serious except for maybe common domestic problems. But none in this picture takes anyone to any kind of looming precipice. A “pleaser of crowds” in spades. While Ben struggles getting on Face Book and finding the proper things to press on his keyboard, he slips into the workaday, new millennial world of About The Fit. He becomes more than just Jules' intern, but her quasi-chauffeur as well; and for short stretches, he babysits for Jules and her husband's way too darling little girl who's been given great lines. De Niro looks so right at being a grandpa. And the sports jackets and neckties he wears are really cool. The ties look like those dusty ones in my closet. De Niro can do anything. All we have to do in our head is list the numerous characters he's done across these years. During an internal thought process of mine, as I was watching Ben shuttling Jules in an SUV about Brooklyn for important meetings, I suddenly thought, “Wow, this is the second time I've seen Robert De Niro in the role of a taxi driver.” Then I moved on with where the script (written by Myers) was taking me. An extended sequence occurs where the movie might have lost forward thrust. By accident, Jules misdirects an email intended for someone else to her grumpy mother, describing her mom using the term “bitchy.” Jules is undone by her blunder and enlists Ben and three younger male employees to help her out of the predicament. It boils down to De Niro and his “gang” entering Jules' mom's home to delete the email from her computer before she gets around to reading it. Funny ... but a bit forced, even if it's a hoot to see De Niro in the middle of a comedic scene while sirens wail outside Jules' mom's place. The film has a nice balance, cleverly designed for younger people while attracting those who are De Niro’s vintage. Junior members watching in the cinema will automatically latch on to all the IT action going on, and when De Niro starts dating About The Fit's middle-aged masseuse (played by Rene Russo) after she gives him an in-office, at-the-desk chair massage, everyone one is “all in” for the breezy, sweet fun The Intern allows. Not to be outdone by De Niro's character, I just want to say that I have now dumped Windows 10 from my pc and so happy to be back with Windows 7.